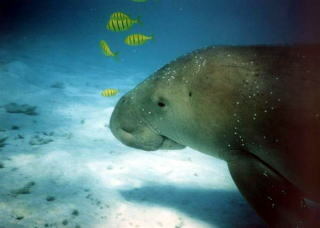 The dugong (sea cow) where you is could swim with, is no longer at Pulau Mantanani. I hope he's in search for better grass somewhere else, but it could also be that he's dead. 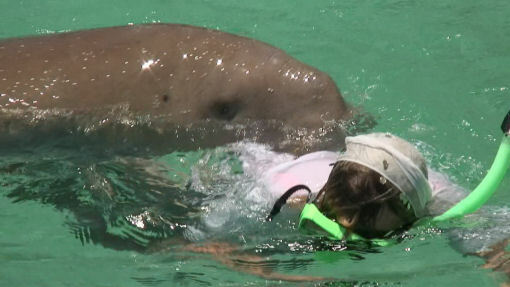 If you want to make this excursion, you'd better ask, whether the dugongs are back or not. The dugong (Dugong dugon) is endangered by hunting (men and sharks) and by destruction of its natural habitat. In many regions worldwide dugongs are facing the threat of extinction, and it is likely that this is also the case in Sabah. In the World Conservation Union Red Data book dugongs are listed as "vulnerable to extinction" and the international trade in dugong artefacts has been prohibited in the Convention on International Trade in Endangered Species. 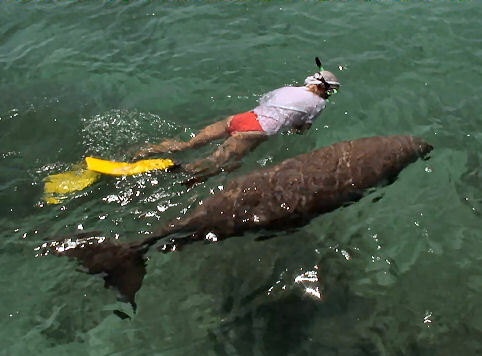 The most famous dugong is Nicky, a young male dugong who frequents the warm tropical waters around the Mantanani Islands. 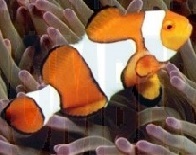 Nicky gets his name from the small cut or "nick" in his left tail fluke, and this is the way you can recognize him. He is a juvenile male of about 2 meters (6.5 feet) in length - he still has much growing to reach maturity (mature dugongs are up to 3 meters or 10 feet long). Usually you can see Nicky alone, although there are other dugongs in the vicinity. Sometimes you can see a mother and her calf. Dugongs are often called sea cows due to their large size and herbivorous nature. While they may consume over 15 different species of sea grasses, their preferred varieties (which are found in abundance on Mantanani) are species of the genera Halodule and Halophila. Dugongs consume vast quantities of sea grass: a fully-grown dugong will eat up to 35 kg per day, a tenth of its body weight. As they pluck up the sea grass, the dugongs leave tell-tale meandering paths of white sand in their wake -- a feeding trail. Dugongs do not consume the blades of the grass alone, but pluck up the nutritious rhizomes, or roots, growing under the sand. Since they require such large quantities of sea grass each day, they may have to move between feeding sites allowing grazed areas to regenerate. Despite their large dimensions of over 3m in length and 350 kg, dugongs can reach top speeds of 25 kmh. The average cruising speed of 10 kmh can be sustained for long periods and the dugong may travel for hundreds of km in just a few days. The pectoral flippers are used for steering and braking, and also for sculling to keep the head above water when it breathes in choppy seas. 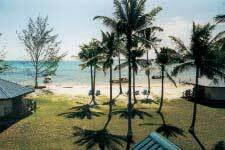 Mantanani Island Resort is located at the western end of the largest island and lies on the edge of an enchanting white sandy bay. Nestled among the tall coconut trees are 9 rustic beach chalets that come with attached bathrooms, hot showers and air conditioning. The resort caters not only to divers and bird watchers but it is also the perfect getaway for anyone who appreciates the serenity and tranquillity of a paradise island. 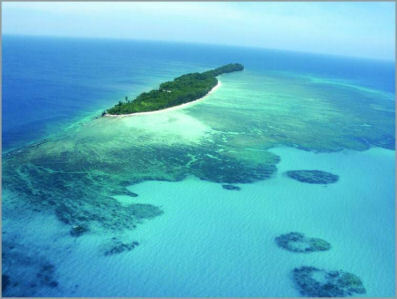 To get to Mantanani, one would have to take a direct flight from KLIA to Kota Kinabalu in Sabah. From Kota Kinabalu, make your way to Kota Belud by road, which takes about an hour. Once in Kota Belud you would have to take a speedboat, which can take up to another hour to get to Pulau Mantanani.